Celebrated Tanzanian artiste and socialite Zari’s fiancee Diamond Platinumz will perform at this year’s Kampala City Festival scheduled for October 6 to 8, the event organizers have revealed. The video was uploaded and shared by KCCA on their Youtube channel. It shows Musisi paying a courtesy visit to the Tanzanian artiste’s recording studio. Jennifer Musisi (centre) receiving a dummy cheque from one of the sponsors of the festival. Courtesy photo. The festival that will commence with a charity concert aims at raising money to renovate, build and equip schools in the city. John Ddumba, the chairman organising committee, introduced his team and the various sponsors who include Airtel, City Tyres, Bell Lager, Movit and Kampala Casino. This year’s platinum sponsors, City Tyres, gave Musisi a blank cheque. Other sponsors include Christ Embassy who gave the Authority UGX100m, Airtel UGX 500m, Bell Larger UGX270m,Movit UGX70m while Kampala Casino donated UGX70m. 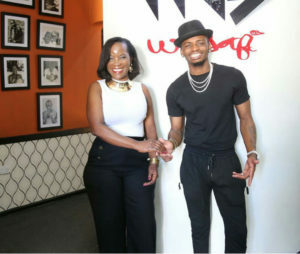 Jennifer Musisi greets Diamond Platinamuz. The former paid a courtesy visit to the Tanzanian artiste’s recording studio. Kampala City Festival that was first held in 2012 is a signature brand that draws multitudes to Kampala every first Sunday of October to celebrate culture, unity and provides immense networking opportunities for business. The biggest street party in East-Afrika is now an annual event that brings together all City dwellers, stakeholders and business people. It focuses on togetherness, one of the city’s oldest and richest cultural ideas. On this fine occasion, song, dance, food, entertainment, merry making, shopping, culture and diversity are all enjoyed right in middle of this great metropolis. It’s a much anticipated moment for citizens to share and learn while acting as an economic engine for organisations to grow, network and prosper. It provides a platform to celebrate the many things that set Kampala apart from other cities. Jennifer Musisi speaks at the launch of the festival. Courtesy photo.